Originally from Texas, Sue Taylor-Cox now lives with here family in Indianapolis, Indiana. Married, with two teenage children, Sue was employed as a teacher for many years, but now works from home where she is able to devote her time to her loves of art and writing. Sue’s husband leads a hectic life as a financial adviser and her two children are constantly on the go, juggling school work with sports, out-of-school activities and time with friends. A couple of years ago Sue set out to see if she could find an activity which the family could do together to reduce stress levels in today’s world, and to spend time together, slowing down and relaxing. In her search she came across coloring and, at first, she dismissed it because, although she saw the power in it as a tool for lowering stress, she couldn’t quite see how it could work as an exercise for the family as a whole. Despite this, it kept nagging away at her and, finally, she simply jumped in with both feet and introduced coloring sessions as a regular family activity. It worked! indeed, it was a huge success and continues today as firm part of the family’s weekly routine. In the light of her own experience, and with a life-long interest in art and writing, it was only natural that Sue should create her own series of adult coloring books. 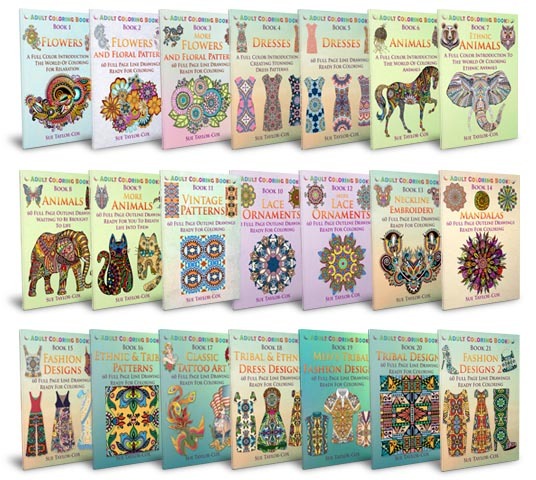 Starting with an idea for a handful of perhaps four or five books, the project has grown today to no fewer than twenty wonderful coloring books, all of which are suitable for both adults and older children.